The tobacco industry has marketed this new generation of smokeless tobacco products as a temporary way to deal with increasing cigarette taxes and smoke-free policies in public places. Despite the risks, these products, which include snus and dissolvables such as strips, orbs, and sticks, are being promoted by the tobacco industry as less harmful, more convenient, and more socially acceptable alternatives to traditional cigarettes. There is no scientific evidence that these products are safe, may be considered a safe substitute for, or are an effective means of quitting tobacco use. Wow, where to even start? Promoted by the industry as less harmful? If this were really true, these ANTZ would be filing lawsuits, not issuing lie-filled proclamations, since the industry is forbidden from making that claim no matter how obviously true it is. So the manufacturers are stuck with other messages, like “more convenient” and that it can be used anywhere, as their only ways to try to persuade smokers to switch to low-risk alternatives. As for objecting to “more socially acceptable”, apparently the ACS is now claiming that producing environmental tobacco smoke is socially acceptable — a bold move! And, oh look, the classic strawman game of suggesting that someone is claiming that the products are perfectly safe, as an attempt to hide the clear evidence that they are about 99% safer. Some lies just never go out of style. This is naturally accompanied by the out-and-out lie that there is not overwhelming evidence that switching to these products is a proven very effective method of smoking cessation. With all of these lies, it seems hardly worth bringing up the absurd characterization of “new” for such products as snus, or even dissolvables (which ACS’s patrons in pharma have been selling for decades). My favorite from this paragraph, though, just because it is not the usual lies, but a novel bit of stupidity, is the suggestion that these products are a “temporary way to deal with increasing cigarette taxes”. Huh? Is she claiming that cigarette taxes are expected to drop, so only a temporary response is needed? What she is definitely admitting is that cigarette taxes are not actually intended to incentivize smokers to reduce their risks, since otherwise switching products would be considered a success and not a failure. There is research, however, to show these products cause cancer of the mouth, pancreas and esophagus, as well as other serious health conditions. There is just one problem with that claim: the research actually shows that there is no such risk (nothing large enough to be measurable). You might think that the ACS had a competent scientist or two on staff who could actually understand the scientific literature. I wonder what they are doing with all that money that people give them? So long as tobacco products continue to be responsible for nearly one out of every five deaths in America today, tobacco product manufacturers cannot pose as being the solution. To paraphrase, so long as automobiles continue to be responsible for almost all roadway deaths in America today, auto manufacturers’ efforts to improve safety features cannot pose as being the solution. This is a new twist on the old tobacco marketing campaigns of the 1960s, 1970s, and 1980s that falsely promised health benefits to be derived from filtered, “light”, and “less tar” tobacco product alternatives that were “more safe” versus “less safe.” These “harm reduction” messages were false then and are false now. Ah, now there is a classic. Never mind that the public health community was the primary driver behind the light cigarettes failure. 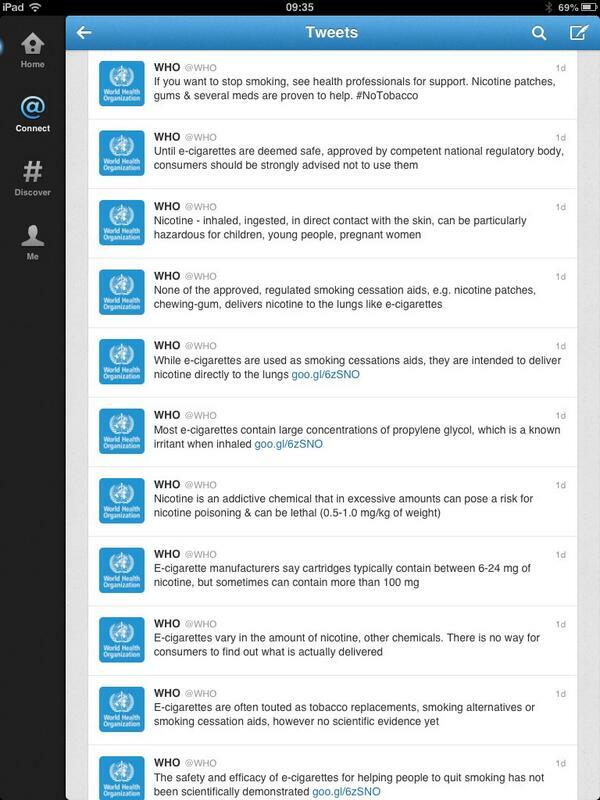 The current “public health” community wants to memory-hole that inconvenient fact. Just consider how faulty the parallel is: Light cigarettes were a speculative intervention, based on little more than guesswork, and turned out to be a failure. Smokeless tobacco products have been shown, after centuries of use and decades of research, to be low risk. Exactly how are these similar? So the harm reduction messages, coming from both public health and the cigarette industry, were wrong in the 1970s, and therefore …um… no harm reduction message, no matter how overwhelmingly evidenced-based, can ever again be correct? Frankly, it might be a good tradeoff to use that as a basis for disregarding messages from the industry today, so long as we could also use it as a reason for disregarding every message from “public health” today. New rule: Anyone who has ever aggressively pushed a health message that turned out to be wrong is not allowed to talk anymore. And, yes, I am talking to you, ACS and Ms. Eagleton.